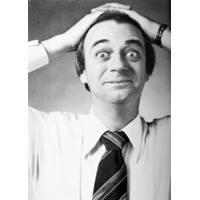 Roy Hudd, OBE (born 16 May 1936, Croydon) is an English comedian, actor, radio host and author, and an authority on the history of music hall entertainment. His father was a carpenter and he attended Tavistock Secondary Modern School, Croydon and Croydon Secondary Technical School. His jobs then included a messenger for an advertising agency, window dresser and commercial artist. In 1958 he took a summer job as a Redcoat at Butlins, Clacton. From the Daily Mail: Roy and Debbie met nearly 30 years ago in panto in Nottingham. Debbie, a dancer, now directs panto. Roy was already divorced from his first wife, Ann, with whom he has a 45-year-old son, Max, a stage manager. Roy and Debbie married in 1988. 'Debbie is 22 years younger than me, it's amazing, people never picked up on that. It never bothered us.' They have no children. 'We tried and tried, but we didn't get lucky,' says Roy.